The Steady Trade Podcast isn’t necessarily about shock value. Rather, we want to help traders build a strong foundation so that they can enjoy a long and profitable career. 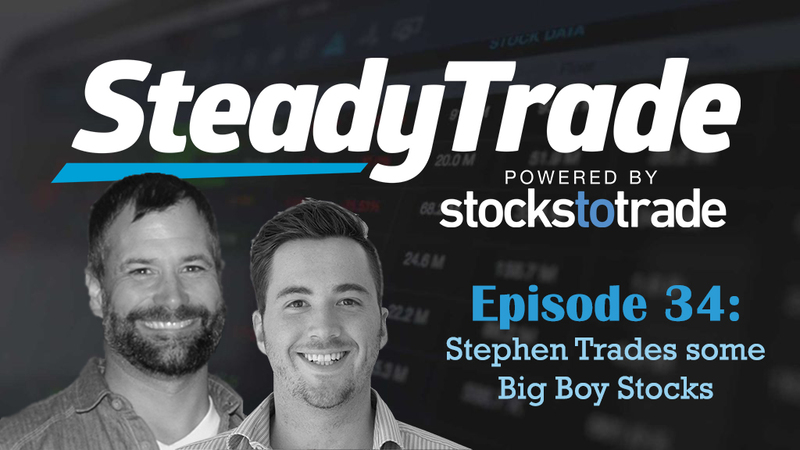 However, in this episode, Stephen Johnson does indeed shock co-host Tim Bohen with a revelation: he’s trading big boy stocks now. That’s right: Stephen has tested the waters of trading higher-priced stocks, and the results have been encouraging. In the episode, Tim and Stephen explore the world of higher-priced stocks and how penny stock traders can stand to benefit from trading them. It’s a common misconception that if you have a small or medium-sized account, that you can only trade low priced stocks. Many new traders think that they can really only trade stocks that cost between pennies and a few dollars. But as Tim points out, as amazing as low priced stocks are, they do tend to have a feast or famine cycle: they can go from busy to quiet on a dime. Many traders don’t even realize that they can trade higher priced momentum stocks. Yes, you have to be selective and pick the right ones, but if you catch the right idea at the right time, you can make more money per trade. Higher priced stocks can also be easier to chart because as Tim says, the moves aren’t as “wonky”. You don’t have bizarre 300 percent moves like you’ll see in the world of penny stocks, so they’re easier to track. It is also far easier to find shares to short! Stephen used to be underwhelmed by higher-priced stocks. He thought there wasn’t much volatility in higher priced stocks, there was no edge, and they were mainly for people with bigger accounts. But then, he evolved. In the episode, you’ll learn how in charting social media stocks, he was able to identify catalysts that made him realize he was well positioned to profit. Tim is amazed by Stephen’s prowess: he took into consideration technicals, fundamentals, the news, the hot trend, and he built his case before trading. No, this doesn’t mean that one will profit all the time, but it heightens the potential for success quite dramatically. Curious about trading higher priced stocks? In the episode, Tim and Stephen discuss ways for penny stock traders to start looking at higher priced stocks. To start, they discuss important differences between approaching a penny stock trade versus trading a higher priced stock. Looking at daily ranges and scaling expectations is key. For instance, looking for stocks that are making big moves relative to the price for share is vital. The same type of movement that might be significant on a penny stock is going to have to be scaled up dramatically for a $10 or $20 per share stock. In the episode, Tim dishes on an invaluable trick for every trader who wants to delve into higher-priced stocks. The so-called “rule of tens” is something he applies to stocks over $10 or so. It’s a ratio in which he divides the position size by ten and offers an easy trick for traders to determine a comfortable rate of trading on these higher priced stocks. Safety first, for you and your account! Tim and Stephen also talk about some important cautions for buying larger stocks. Traders should never underestimate the other side of the trade and must avoid becoming over exuberant. Of course, then again, this is part of the beauty of trading: if everyone were rational, traders would never get these opportunities. But you don’t want to be the cautionary tale! In finding success trading higher priced stocks, Stephen feels reborn. “Tim Bohen, you are right about high priced stocks” is his battle cry, and he now sees brand new opportunities as a trader. Moreover, higher priced stocks can offer a great way for penny stock traders to diversify! Got a question about this episode, or any other episode? Be sure to visit the “submit your audio” section to submit your inquiry. Your audio might just be featured in an upcoming episode! Thank you for another great Podcast guys. Never really thought about looking at the higher priced stocks but it makes sense to at least have a scan for these as well and that you can still make the 10-20%+ gains that can be made on the lower priced stocks. Glad you found it useful Mick! Higher priced stocks, not a bad idea, I am going to take a look at that. Thanks guys, keep up the good work. Thanks Cal!! $CENX a perfect example of this the last couple days! Stephen is conscientious, diligent, punctilious, and I’m tautological. Thank you for listening Edwin!! Where does steven live? I thought he lived in the UK or Ireland, but a couple comments he made sounded like he lived in arizona or somewhere in the US? Stephen is in Dubai currently. Great Podcast Fellas! I have recently moved from trading small caps to High Beta stocks and selling options, with just a select few small cap trades. Trading only a couple of handfuls of stocks on 60 min pivots and growing my acct. #PS60 Thanks for what you guys are doing!